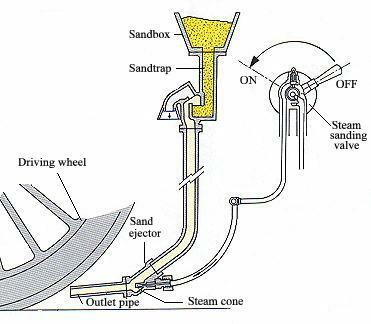 Since the early days of steam locomotives, it has been normal to apply sand to the rail head to prevent wheels slipping and so aid their adhesion. Developments over the years have been made to improve the design of the equipment so that the sand is applied correctly under the driving wheels in all weather conditions. Most systems require the sand to be dry, free from pebbles and with a low clay content to ensure its free running capabilities. Drying and sieving the sand was performed in a furnace at the locomotive depot. In the mid-19th century, there were some quite crude designs in use. In some cases, a sandbox was fitted inside the cab from which the fireman was expected to scoop up a handful of sand and pour it down a funnel onto the rail, however, as the fireman could only sand one side of the locomotive at a time, there were high risks of twisting stresses in the axles as one side gripped before the other. Another design placed the sandboxes in front of the wheels with a disc valve, rotated by a linkage inside the cab and allowing the sand to fall onto the rail. Problems though were encountered with the disc valves jamming in their gritty environment and the placement of the sand ahead of the wheel meant that strong winds could blow the sand off the rail before the locomotive could effectively make use of it. The Midland Railway realised the shortcomings of these designs and in 1886 adopted a system developed by the Derby works manager, that used compressed air bled from the the Westinghouse brake pump to blow the sand under the wheels. Westinghouse objected to this on safety grounds, and so the design was adapted to use steam instead of compressed air, and this system was widely adopted throughout Britain.